Cross and Cutlass: A cool rapture verse in the OT you wouldn't suspect AND Rapture next month??? A cool rapture verse in the OT you wouldn't suspect AND Rapture next month??? How many sermons have I heard on this verse where the pastor talks about our lives here on earth... that if we wait for the Lord to help us, we will grow stronger in Him. All true! Yet, as I read it this time, something pressed on me to look up the Hebrew meaning of some of the words. Let me add something else that may encourage you to know how close we are to going home. I am reading through a Chronological Bible. This particular one is for a year-long reading so it's separated by readings for each day. I don't go by the day. LOL.I just started reading the New Testament over again a few months ago. Anyway, last week I started reading the passages for that day, and here's what I saw. You can see by my marks that the passage really struck me. It's what I've been trying to shout from the rooftops these past few years. I even wrote a book about it, When Angels Cry! 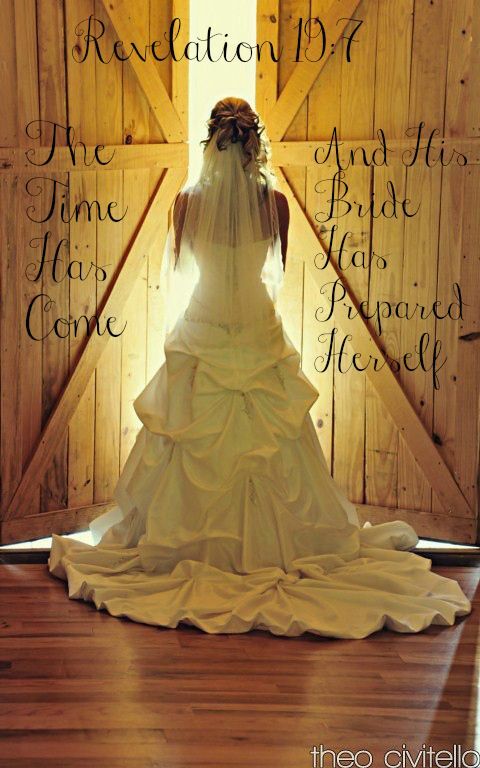 And that message is: Jesus is only coming back for a bride who is READY for him. A bride who has sewn together her wedding gown, whose lamp is filled with oil and is burning bright. The wedding gown is symbolic of obedience by doing the righteous acts God asked you to do. The oil in the lamp is being filled with the Holy Spirit and not hiding your faith from others. Notice that only those who are ready will be rewarded. And those who aren't, whom the Lord finds living lives of sin and disobedience and even lukewarmness, those will be "cut in pieces and banished with the unfaithful". Sorry, but that's what it says!! Where are the unfaithful banished to? Hell. Another thing that really struck me was the date: October 17. Why? Because I listen to a pastor who says our Gregorian calendar is off from the true Jewish calendar by 30 days. If that's true, then the Feast of Trumpets would be around October 9-10 and then Yom Kippur or the Day of Atonement would be around October 17th. Just something to consider. Another compelling reason to believe the true Feast of Trumpets (Rosh Hashana) is in October has to do with the sighting of the new moon after the Autumn Equinox. Which is how the Jewish people from ancient times have done it. If I haven't lost you yet, I encourage you to watch this 22 minute video from Scottie Clarke, the man who studied the stars and discovered the Sept 23rd sign of last year. When is the real Feast of Trumpets in 2018? If that doesn't convince you, there are additional signs in the sky that I find particularly interesting. I trust this guy from Unsealed and he has an article I will link below where he reports that there is going to be a sign in the sky that may depict the Red Dragon of Revelation 12 being cast down. This will occur on October 7-8. It's a long article but very interesting. Am I saying the rapture is next month? No. Just putting the information out there for you to see. I would be remiss if I didn't. But most importantly, I encourage you to be ready for whenever our Lord comes to get us! Thank you!! Awesome post, MaryLu!! "Lord, give us a hunger and thirst for Your Word." Thank you, MaryLu. I never looked at the verse in light of the Amplified Bible. I need to pull my Strong's Concordance out again. Kathy, one of the references I use online is called BibleHub. When you look up a verse there, you can click on interlinear and it will give you the strongs meaning and then list other verses where the same word appears. Really cool!